To celebrate Women’s History Month, we’re featuring items from the PWP Archives* each day on this blog. In looking back, we see not only where we started, but how far photography, women, and the world have come since 1975. When PWP celebrated some of the pioneering legends of women’s photography in the early 2000s, Erika Stone was a vibrant participant (center photo, bottom right, and right photo to the left of Ruth Gruber). It was a popular, all-star evening. In the left picture above former PWP president Katherine Criss speaks with Rebecca Lepkoff. The center image above features Tequila Minsky, Rebecca Lepkoff, Nancy Reynolds, Katherine Criss (top row, left to right); Ruth Gruber and Erika Stone (bottom row, left to right). 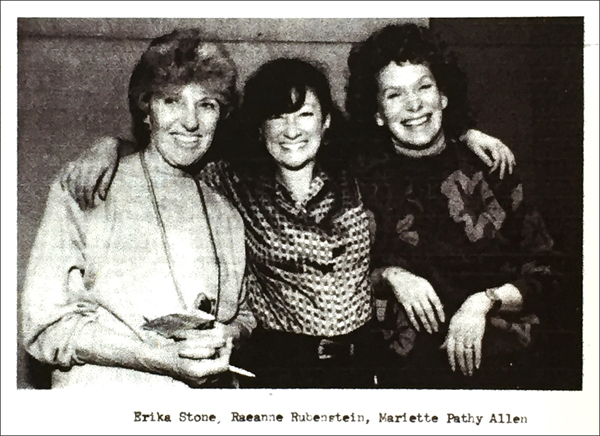 The right image above shows Erika Stone and Ruth Gruber, who is holding up her book Witness.